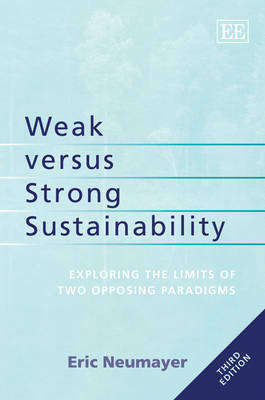 This third edition of an enduring and popular book has been fully updated and revised, exploring the two opposing paradigms of sustainability in an insightful and accessible way. Eric Neumayer contends that central to the debate on sustainable development is the question of whether natural capital can be substituted by other forms of capital. Proponents of weak sustainability maintain that such substitutability is possible, whilst followers of strong sustainability regard natural capital as non-substitutable. The author examines the availability of natural resources for the production of consumption goods and the environmental consequences of economic growth. He identifies the critical forms of natural capital in need of preservation given risk, uncertainty and ignorance about the future and opportunity costs of preservation. He goes on to provide a critical discussion of measures of sustainability. Indicators of weak sustainability such as Genuine Savings and the Index of Sustainable Economic Welfare - also known as the Genuine Progress Indicator - are analyzed, as are indicators of strong sustainability, including ecological footprints, material flows and sustainability gaps. This book will prove essential reading for students, scholars and policymakers with an interest in ecological and environmental economics and sustainable development.